The all-British heavyweight bout between David Price and Kash Ali in Liverpool ended in bizarre fashion as Ali was disqualified for biting. Price, 35, landed a stinging shot on undefeated 27-year-old Ali in round five, prompting a grapple. Ali fell on top of the Liverpudlian and appeared to bite Price near his rib cage. Ali was officially disqualified for biting and left the arena beneath a barrage of drinks thrown by fans. A British Boxing Board of Control spokesperson told BBC Sport Ali would appear before its central area council "in the future", where he is likely to face further sanction. Saturday's victory - greeted by confusion and a chorus of boos at Liverpool's M&S Bank Arena - extended Price's record to 24 wins and six defeats and was a first loss of Ali's 16-fight career. In the build-up to the fight, Price had vowed to punish his former sparring partner, who had called him "a quitter". Price revealed that Ali had asked for a rematch but he insisted: "I don't want to share the ring with an animal like that." Ali lost his fee for the fight and former world cruiserweight champion Tony Bellew called for him to be banned. "He is a disgrace for what he's done," Briton Bellew told Sky Sports. "Biting a man on the floor? There's not many things lower." 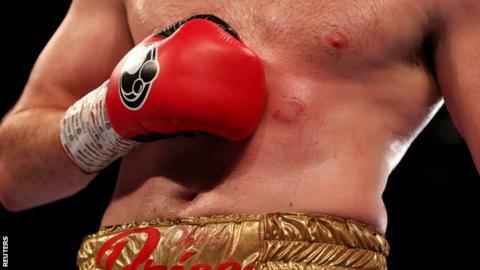 In 2009, British boxer Dereck Chisora was suspended for four months and fined £2,500 for biting Paul Butlin. Five years later, Wadi Camacho bit Welshman Craig Kennedy on his neck, though the Spaniard did not receive a ban. In 1999, British middleweight Adrian Dodson was banned for 18 months and fined £1,000 for biting Canadian Alain Bonnamie. The sport's most notorious biting incident also came in 1999, when Mike Tyson bit off part of fellow American Evander Holyfield's ear and subsequently lost his boxing licence, though it was later reinstated. The main event of the evening saw former world champion Liam Smith claim the vacant WBC silver super-welterweight title by stopping fellow Briton Sam Eggington in round five. The referee stopped the fight after Eggington suffered a badly cut eye early in the bout. In a meeting of two former Commonwealth Games champions, Preston's Scott Fitzgerald was roared on by a healthy travelling support to land a dramatic win over Liverpudlian Anthony Fowler. Fitzgerald crucially floored Fowler in the 10th and final round, despite being in survival mode three minutes earlier when he took a crushing uppercut. But his knockdown - arriving courtesy of three solid left hooks - got him over the line for a split decision win 94-96 95-94 95-94. It extends his record to 13 wins from 13 and inflicts a first professional defeat on Fowler.